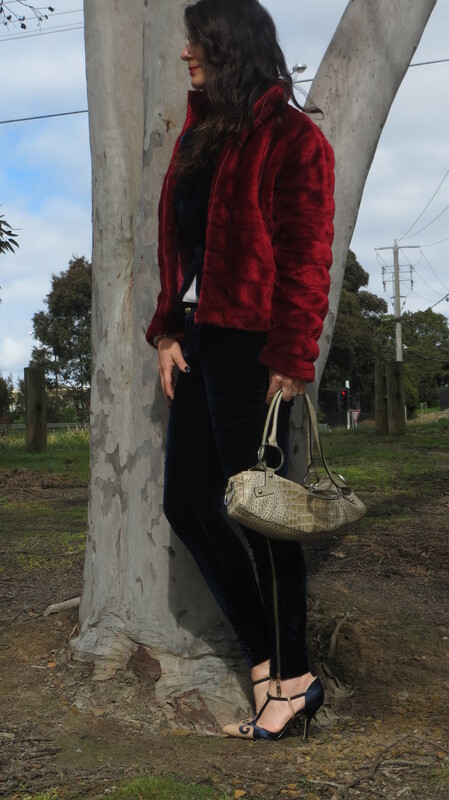 Worked a navy blue velvet pants-suit with a raspberry fur jacket at my ladies group at church today. Any excuse to dress up will do! After burying my feet in warm, comfy boots all winter I must admit it was a real shock to the tootsies in these Wittner heels. The straps were digging in, so they were relegated to the back of the shoe-drobe when I arrived home. This Guess handbag is an oldie but a goodie. While it feels great to de-clutter the wardrobe, there are some things worth hanging onto and thankfully, this is one of them. A few weeks ago my agent put me forward for a few television commercials, all of which I missed out on! At first I wasn’t too phased, but by the time the last no came in, I was questioning God about it. You see, when a job comes up I surrender it to my God because I know how much he loves me and I know he sees the big picture and will bring what’s best for me. Just like you as a parent would do for your child! Incredibly, while working on Underbelly last week I met a girl who worked on one of the commercials I missed out on. After hearing about the freezing cold conditions and how they stood around in mud for hours, I was extremely relieved and thankful I didn’t get it! God sees the big picture and if you allow him, he will protect you. I hope you guys enjoy some rest and peace between all the juggling. And now you’re Looking Good Girls! “Come to me, all you who are weary and burdened, and I will give you rest. Take my yoke upon you and learn from me, for I am gentle and humble in heart, and you will find rest for your souls. For my yoke is easy and my burden is light,” Matthew 11: 28-30.